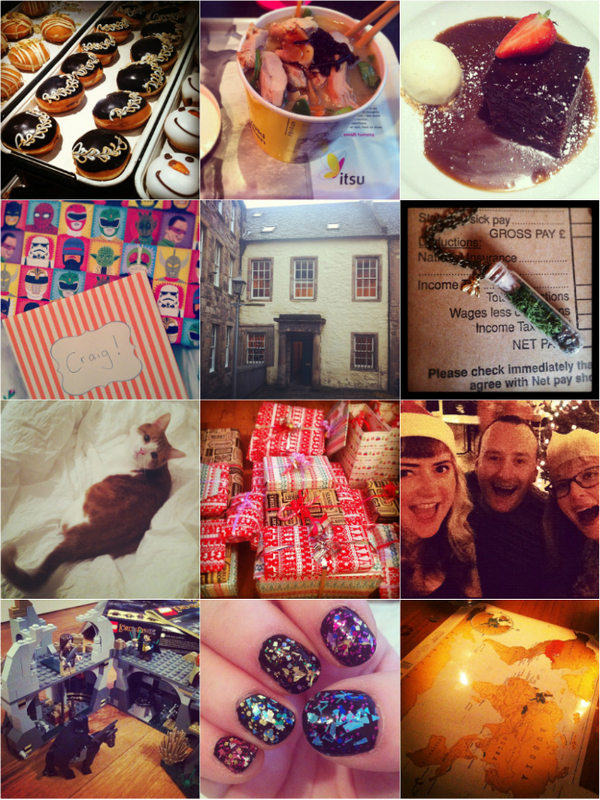 Even though we're only on day four of January living, it feels quite strange looking back on the excesses of December! As with everyone else, I am back at work, choked up with a cold & struggling trying to get my body out of holiday-mode and back on a normal sleep pattern! Still, December is one of my very, very favourite months, so I'll forgive it. 1. And the December diet begins! We were in London for the first weekend of the month to celebrate Craig's exam being over, party for his birthday AND see my wonderful pal Steph (phew!) and I tried my first Krispy Kreme at the airport. I am generally a fan of doughnuts, but was pleased to see that they lived up to the hype. 2. When I was waiting on Craig to finish his exam I went for a wander round London & found the nicest little Japanese takeaway, itsu. Super tasty. 3. Back in Edinburgh & out for dinner to celebrate Craig's birthday. I normally don't get pudding in restaurants, but strange things happen in December. This was sticky toffee pudding & it was delightful! 4. It was Craig's birthday! Happy birthday darling! 5. This is where I work - a very old building in a lovely courtyard in Edinburgh. We share the building with a book publisher who had a Christmas tree with very sparkly lights in their window, which made walking into work on freezing cold mornings that little bit nicer. 6. My new necklace by my very talented pal Lucy, who also designed my blog header. 7. Riley being adorable. He has been loving the holidays as it means he's been allowed out to play everyday (he's only allowed out when it's light, so usually just gets out at the weekend). 8. Presents! These days my favourite part of Christmas is getting gifts for my pals & family & wrapping it up all fancy! This year I used paper from Paperchase, candy canes & tiny baubles tied to each present. 9. Muzz, Amy & I at my work's Christmas lunch. Each year I organise the Secret Santa (with military-like gusto, ha) which gives me a good excuse to charge around with a santa hat on all day! We went to Spoon, which is one of my favourite restaurants in Edinburgh - I highly recommend it! 10. I got Craig a LEGO Lord of the Rings set for Christmas (because come on, you are never too old for lego!) and it was SO much fun putting it together. 11. Trying out my new Mirrorball polishes from Models Own (which you can see in action in yesterday's outfit post). Photos don't do them justice, they are so sparkly! 12. Planning out adventures on New Year's eve with a scratch travel map that my dad kindly gave us. I thought I was quite well travelled but was appalled with how little of the map I got to actually scratch off! So here's to more travelling... starting with a long weekend to Athens THIS MONTH (eeeeek), thanks to Craig surprising me with a trip for my birthday. What a super star! My new year's resolutions are going quite well so far & I am keeping instagram updated with pictures of paintings in progress, so feel free to add me if you'd like to stay in the loop. Your December does look rather wickedly indulgent :) But then January is a little on the grim side so we may as well go out! Your wrapping is gorgeous...putting me to shame ;) I bought my brother a scratch travel map for Christmas and I have hardly been anywhere. Me and Robin are starting to think about exciting summer plans though! Also I see you're an Auld Reekie Roller Girl - I've just signed up for Fresh Meat in Feb - eek!